It’s the Great American Eclipse Monday. What an incredible experience that was to watch. 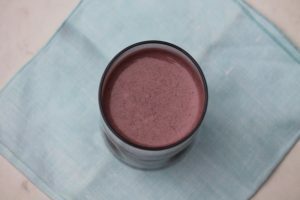 Before this day gets completely away from me I’m here to share this months Recipe Redux post. This month is all about waking up to a savory breakfast. Nothing says rise and shine like a fluffy stack of pancakes. 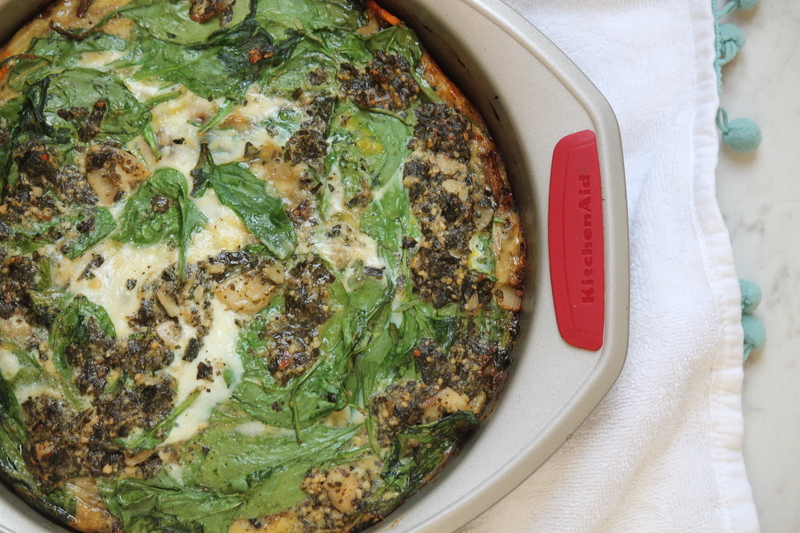 I turned this classic breakfast item into a savory dish packed full of fresh summer veggies. Not to worry though they’re still finished off with that sweet drizzle we all know and love. 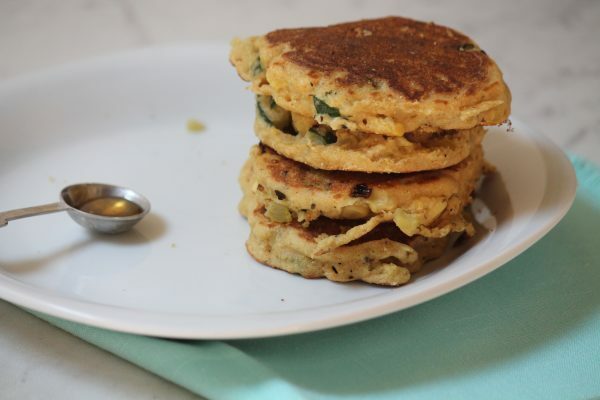 When it comes to breakfast quick and easy is the name of the game, and these zucchini and corn pancakes fit the bill. You can easily prepare the batter ahead of time so all you have to do come morning is scoop them out in a pan and cook. These pancakes are crispy on the outside while the inside stays nice and fluffy. The cornmeal adds an incredible cornbread-like flavor and texture, so basically my friends they’re perfect. Eat them as is or add eggs, bacon, or sausage on the side. Top with Greek yogurt and a drizzle of honey before serving. In a medium-sized nonstick skillet, heat ½ tablespoon butter over medium-high heat. Add the zucchini, onions, and corn, stirring occasionally. Sprinkle with salt and pepper and cook until the veggies soften (10 minutes). Transfer the veggies to a medium-sized bowl . Stir in the basil. In a medium mixing bowl, whisk together the flour, cornmeal, sugar, baking powder, baking soda and ½ teaspoon salt. Melt the remaining 2 tablespoons butter in the microwave. In a small bowl whisk together the egg, milk, yogurt, and the melted butter. Make a well in the center of the dry ingredients and pour in the liquid mixture, whisking until just combined. Combine the batter with the vegetable herb mixture and stir well. Let the batter sit for 5 minutes. In a large nonstick skillet, heat ½ tablespoon butter over medium heat. When the butter has melted use a ¼ cup measuring cup to scoop batter into the pan, (3-4 pancakes at a time). Cook for about 2 minutes, until the pancakes begin to brown on the bottom and bubbles form on the top, then flip. Cook for 1-2 minutes more. Transfer to a plate and repeat with the remaining batter. Add more butter as needed. Serve warm with Greek yogurt and a drizzle of honey. Yum!!! Pinned to try later. 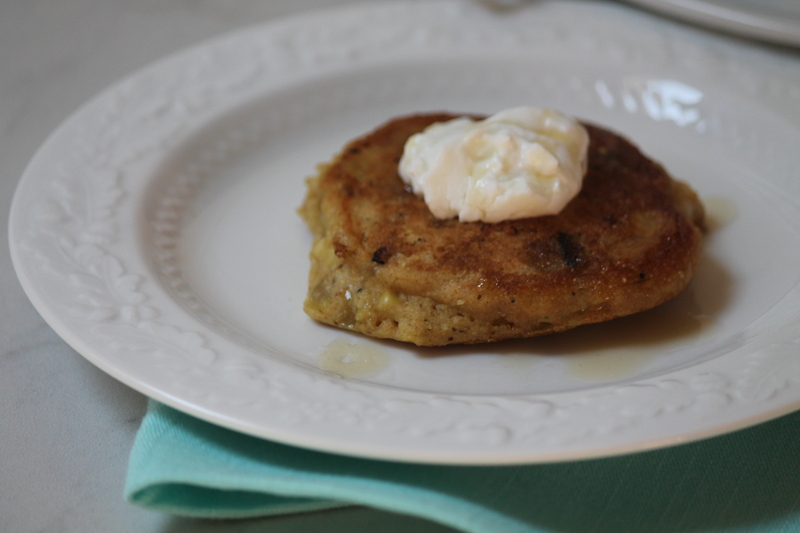 I’ve never thought to make savory pancakes, but these look SO fluffy and delicious. 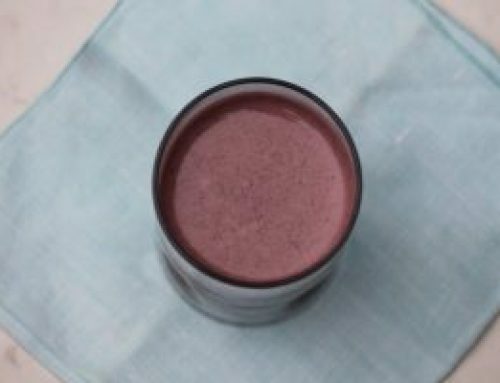 And what a great way to use up some seasonal produce! 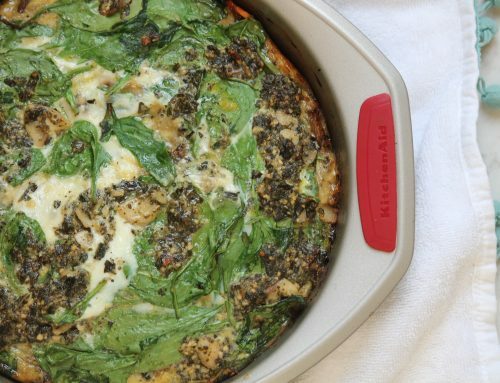 Love this new take on zucchini! Even better with greek yogurt on top for added protein! Tis the season for zucchini recipes and this one is a gem! Will be trying it soon. I love how thick those look! They sound super tasty too. I’m a big fan of cornbread. These are always a yummy side dish I’d love to throw with some sausage or eggs for breakfast! YUM! 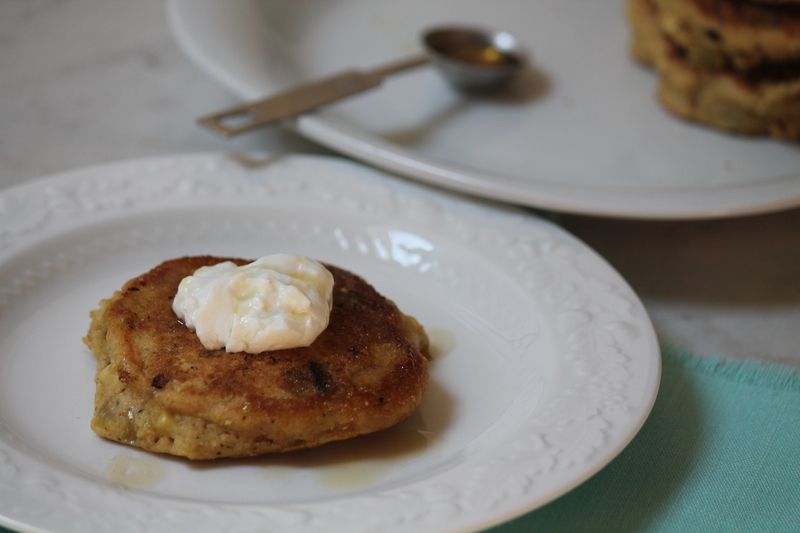 Love that these pancakes are both sweet AND savory!